India’s GSAT-16 telecommunications satellite has been fueled at the Spaceport for its launch on Arianespace’s next heavy-lift Ariane 5 mission, which is scheduled for December 4 from French Guiana. Developed by the Indian Space Research Organisation (ISRO), GSAT-16 will have a liftoff mass of approximately 3,150 kg. It carries Ku- and C-band transponders to further augment communication services across India. 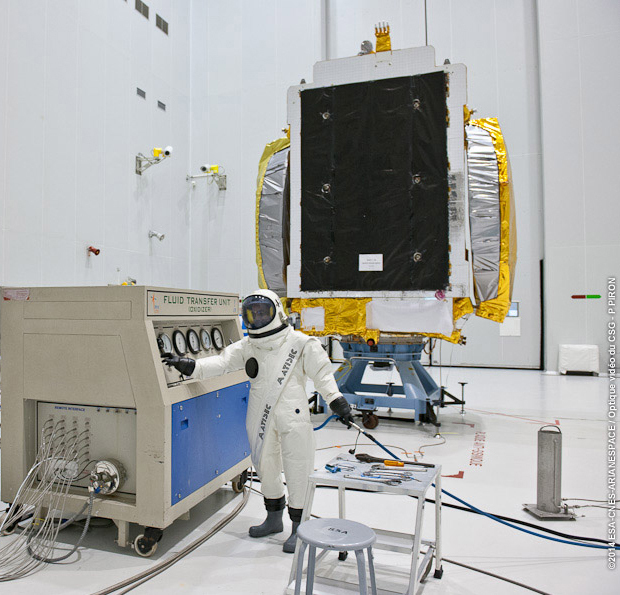 GSAT-16 will be joined on Arianespace’s upcoming Ariane 5 mission by co-passenger DIRECTV-14, which was built by SSL (Space Systems/Loral) for operator DIRECTV. This relay platform is a 20-kilowatt-class Ka-band and reverse-band digital broadcast satellite, to be used in delivering Ultra HD and other new consumer services for DIRECTV. 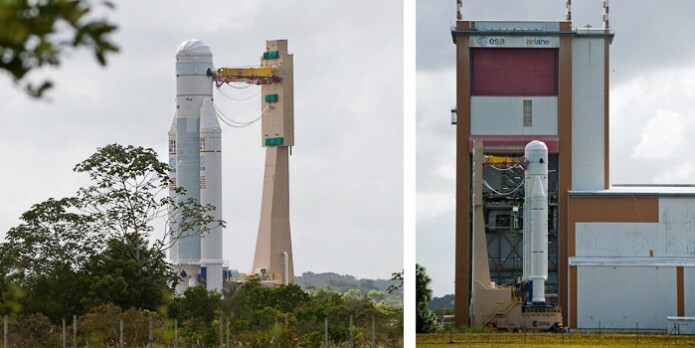 The mission with GSAT-16 and DIRECTV-14 will be Ariane 5’s sixth launch in 2014, and is designated Flight VA221 in Arianespace’s numbering system for its family of launchers – which also includes the medium-lift Soyuz and lightweight Vega vehicles.